We found ourselves heading to Mt. Elbert today after having to be adaptable in our vacation's planning. Yesterday was essentially rained out and forced us to scrap our original plans. We wanted to backpack into Holy Cross but doing so in the rain didn't seem all that enticing. This meant Sunday was lost to us. On the other hand, it freed up Monday for a fun dayhike. 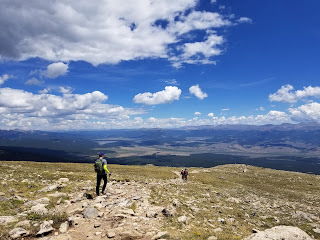 My oldest son Luke hadn't been up Elbert yet and we decided this would be a fun repeat for us older guys. 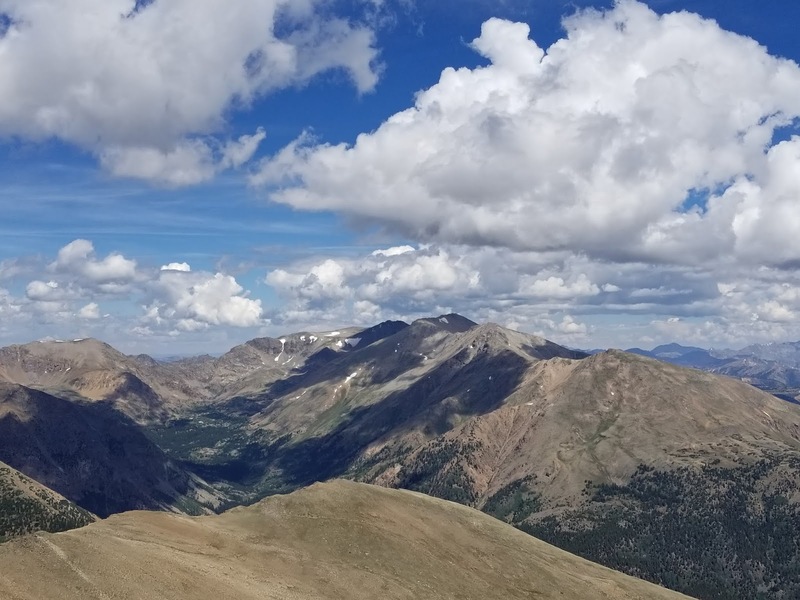 I had previously been up Elbert in the winter in 2012 and in the summer in 2005. Our winter hike went up the East ridge while the original summer hike went up the standard Northeast ridge. My recollections of the original hike weren't strong, other than to recall the infamous false summits. We decided this would be our route. We got up to the main trailhead about 6:15am and found it mostly full already, as seems to be the norm now-a-days. Hopefully this is a sign that the mass of folks out hiking are all understanding the benefits of the early starts. Quite quickly we found the trail to be very rocky but nearly doubletrack wide. 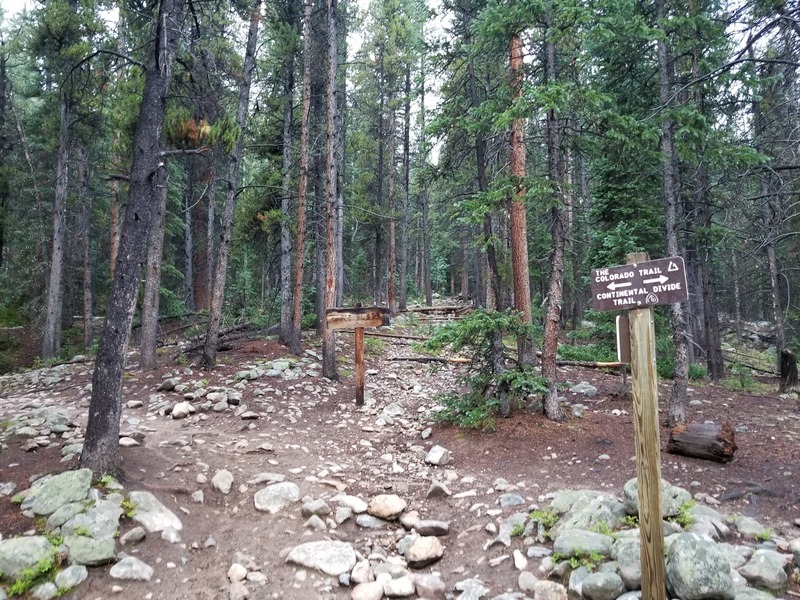 Shortly after start we could see where the old Elbert trail was closed off and now the route follows the Colorado Trail (+ CDT) for its first mile plus. 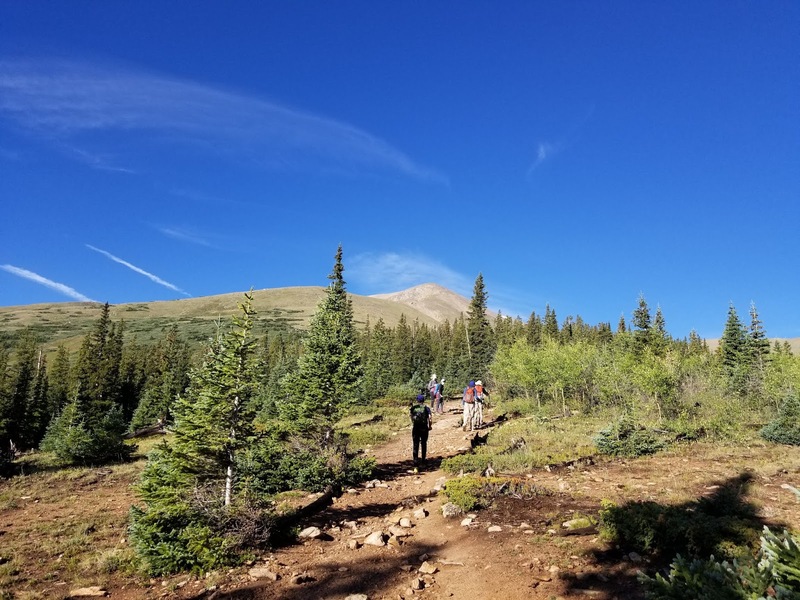 At just over a mile in the trail comes over a ridge and then plateaus for about 0.4 of a mile with even some downhill. In this section was the junction where the Colorado trail leaves and continues southward. 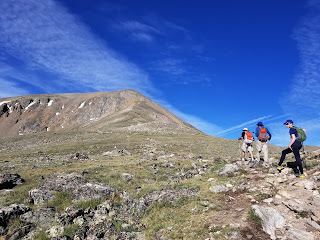 After the junction the trail begins to climb again and winds its way up to the crest of Elbert's northeast ridge where it will remain the rest of the way. We left treeline at just shy of 12,000 feet. When we began to look behind us we were treated to quite a spectacle. It hadn't escape our notice that as we drove in this morning there was a thick cloud cover. It wasn't looking stormy, but it was surely filling the skies. 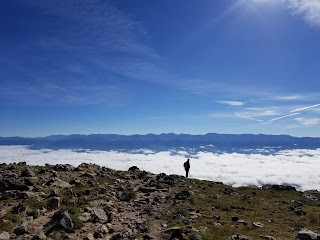 As we hiked upwards through 10,000 and 11,000 feet we could tell at one point we were hiking through a light fog that must be part of the cloud deck. 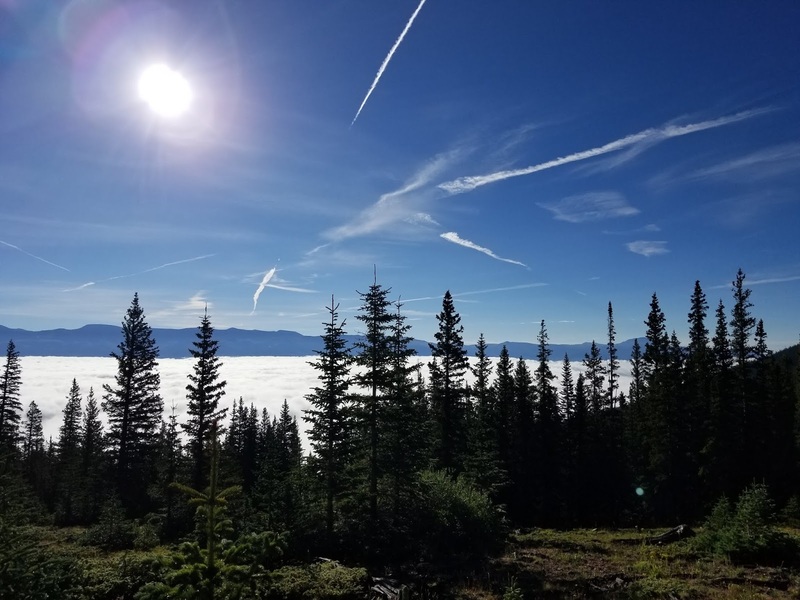 As we looked back we saw an amazing cloud inversion was happening over the Arkansas River Valley and we enjoyed the sight of it. The only time I've seen it more beautiful than this is to see an inversion in the Grand Canyon in Arizona. Up to this point we had leap-frogged along the trail with a few other groups having encountered 15-20 people already. Now above treeline we could see quite a few more groups ahead of us. 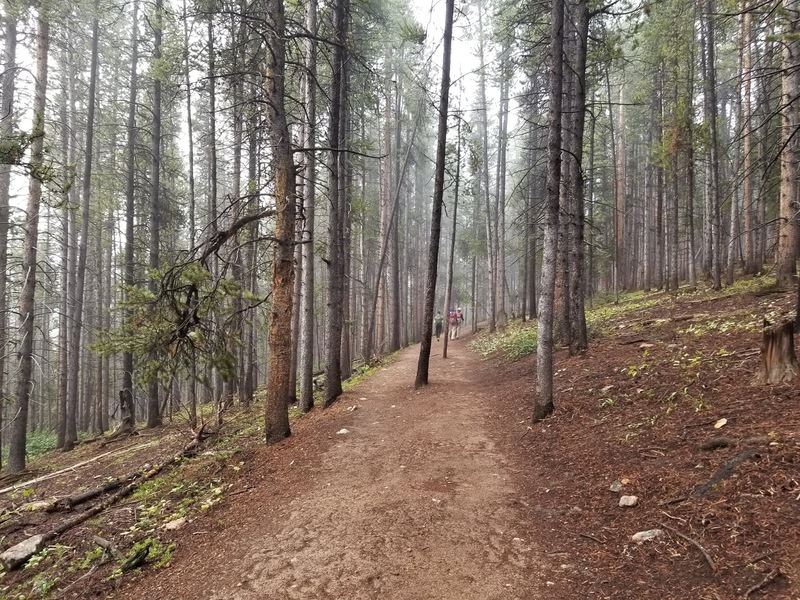 The trail was in mostly good condition. It certainly is easy to follow and switchbacks well enough things never get overly steep. 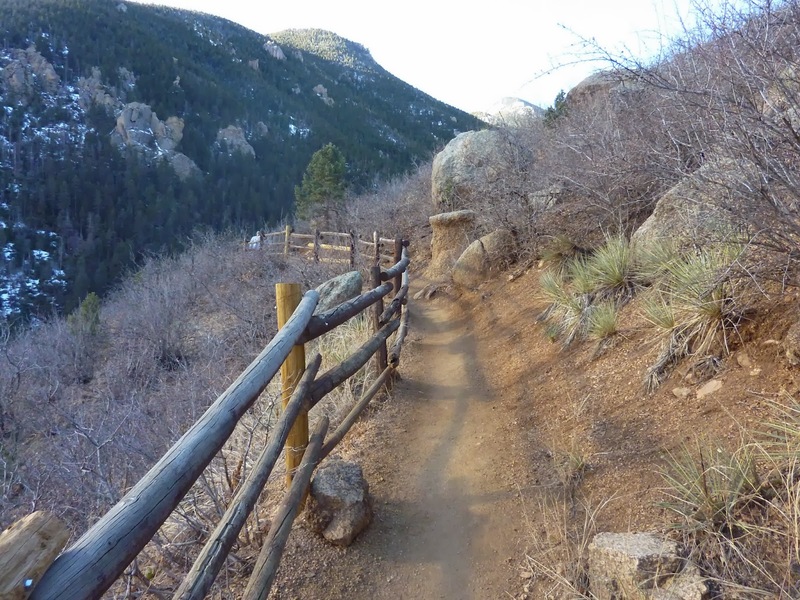 There are however a growing number of spots where the trail begins to braid badly and I know that's something groups like CFI like to protect against to guard against erosion. 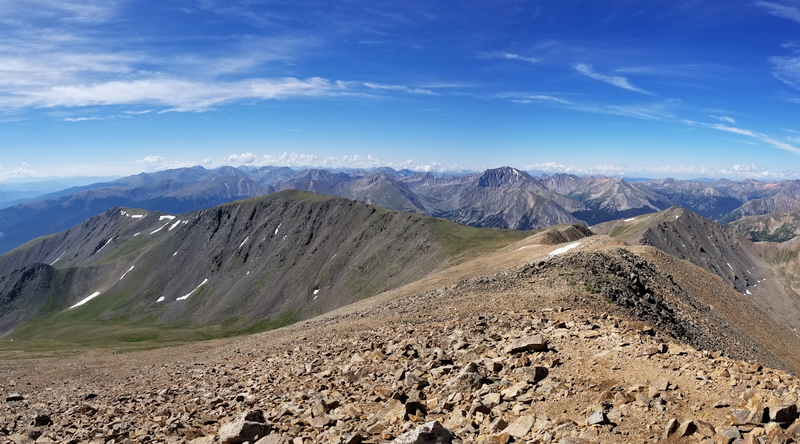 360 Photo from the small saddle at 13,300 ft.
Everyone in our group was moving along nicely, Luke especially. 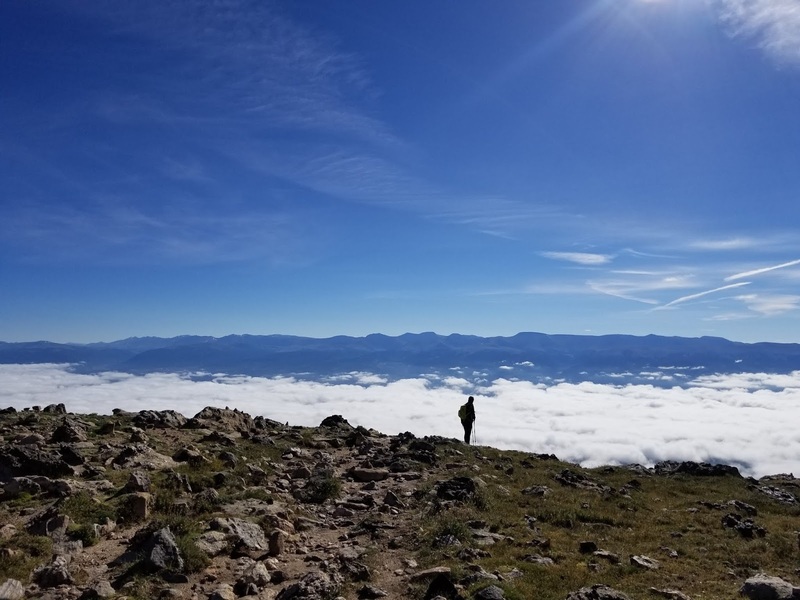 He has proven himself this year, both on our winter ascent of Yale and here on Elbert to just about be ready to be on the same page as us adults when it comes to strength on the trail. 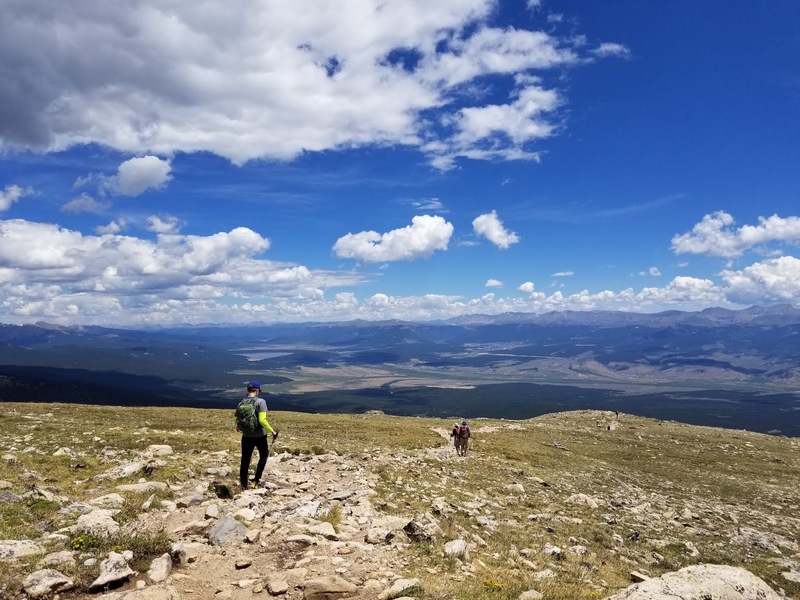 At around 13,300 we reached a small saddle where we took in the views and grabbed a quick breather after having climbed a steep section. We could see a "summit" above of us but knew it to be one of the infamous false summits or "falsies" as we termed them this day. We gained 13,700 where much of Elbert's east side becomes cliffed out. The Northeast ridge doesn't cliff but does become a very steep talus slope. We saw a pair of groups trying to ascend the ridge direct through here. A descending group passed us and said to look for and take the trail that by passes around to the north and the west. With all the braiding of trail in here it could be easily missed, but we found it. 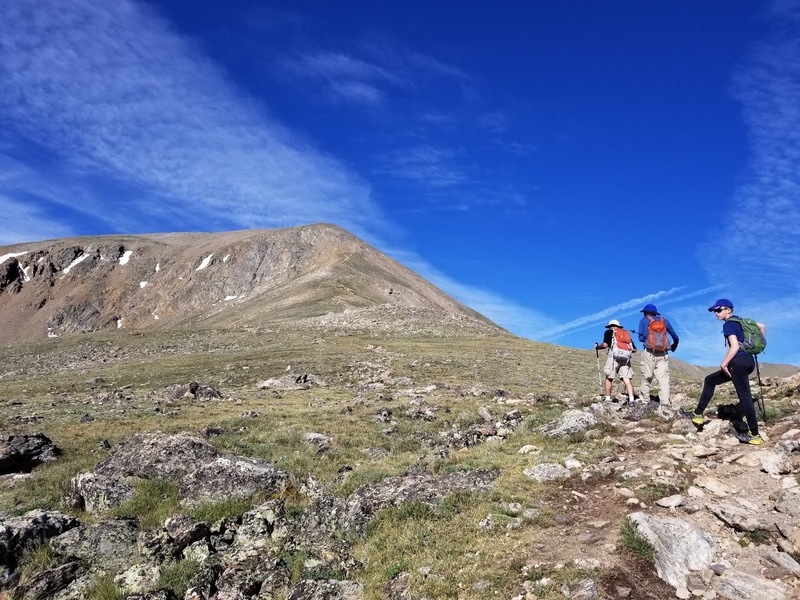 We gained that first false summit around 13,900. Above us was another consistently gradual slope that doesn't look like much at first. You think you're only 10 minutes but we would be another 35 minutes away. This slope above 13,900 just continues and continues and because of the angle it is at it seems to always hide the remainder just out of view. We finally gained the second main false summit at 14,350 which had a large rock cairn atop it. Finally we knew we were almost there. 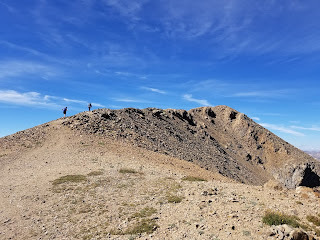 The very evident, finally, main summit was just a brief ridge walk away with a minor gain and easy non-scrambling terrain. We encountered almost 50 people on the summit all having a good time on that beautiful day. 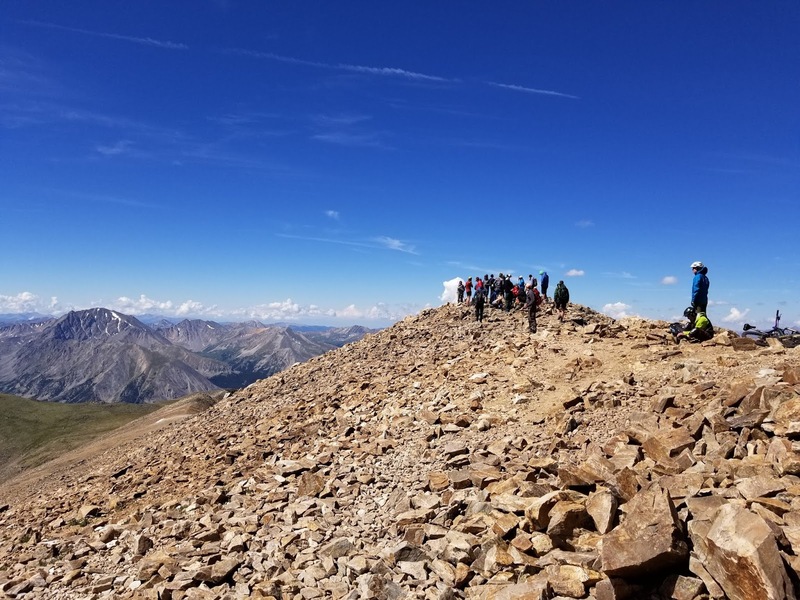 We gathered a few pictures and the like on the true summit and then descended perhaps 200 feet to a nice rock shelter where we found some fantastic seating. Here we relaxed, enjoyed, and ate. We spent almost 45 minutes in the summit area with no real hurry today. As we began the descent we tried to enjoy ourselves and not slip into "death slog mode" too quickly. 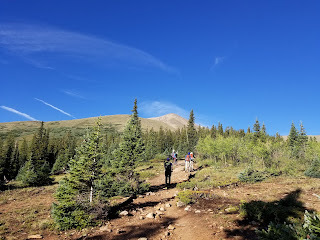 We talked to a handful of people on the way down including a wonderful nice NFS ranger and a group of individuals who work for Honey Stinger and Big Agnes. 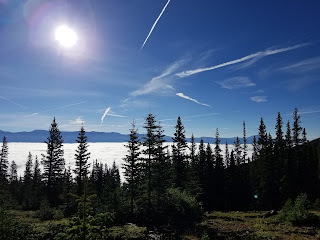 Things warmed up once we got below treeline and it finally became a race to get out before the sun had its way with us. We had made the ascent in 3:48 and the descent still took us 3:21. I won't mention whose older knees probably had something to do with this. All in all a very successful and enjoyable and beautiful day on Elbert. 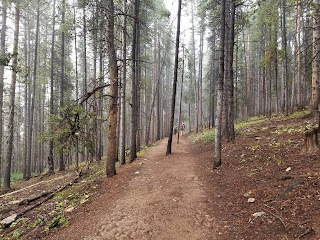 Despite the growing crowds we found most everyone today to be respectful of the mountain and taking good care on the trails. We hope that continues for everyone's sake. 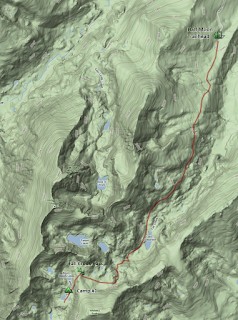 I have a track and waypoints from the hike all contained in a KML file that you are welcome to download and use (at your own risk). 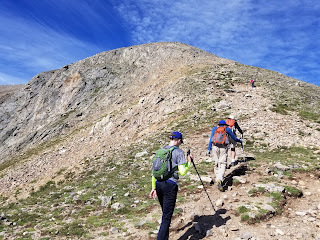 Quandary Peak Traverse + Fletcher Mt.